Hayward City Council chambers. Which two of the seven candidates will take a seat at the dais this summer? THE CANDIDATES Councilmember Marvin Peixoto is seeking re-election to the City Council. Hayward holds at-large June elections with the top two vote-getters winning seats on the council. Four years ago, Peixoto received the most votes following a stint on the Hayward Planning Commission. His strong opposition to the Hayward Loop and the Russell City Energy Center from his days as a commissioner to today appears to be a stroke of genius in this race. Both issues are of great concern to Hayward voters. Peixoto, though, also voted for the controversial five percent wage cut imposition on city employees and has remained resolute in his belief the move was necessary for the city’s financial stability…The controversial vote against workers attracted pro-union candidates Rocky Fernandez and Sara Lamnin into the race. SEIU Local 1021 has poured resources into getting each elected. Fernandez is the only candidate other than Peixoto to hold elected office. He previously served on the AC Transit Board of Directors and currently runs Assemblymember Bob Wieckowski’s district office. In addition to supporting workers, Fernandez said he will seek changes to the Loop and make the downtown area more walkable. Lamnin has faced a series of near misses in recent years. First, for her bid for the City Council two years ago and the city’s school board. She has long been a well-known advocate for the poor and minorities in Hayward…Restaurateur Julie McKillop has also worked with the Hayward Chamber of Commerce and has advocated for changes to the Loop, but as a downtown business owner, she also says the Loop has positively affected her business and that of her neighbors….Rodney Loche has the backing of Mayor Michael Sweeney and is a member of the Hayward Planning Commission. He also an author of children’s books…Ralph Farias, Jr. is the raconteur of Hayward politics, who often stuffs sturdy conservative ideas into a package wrapped in a persona often seen in professional wrestling. Philip Gallegos is a first-time candidate with a belief system in line with Fernandez and Lamnin. QUOTABLE “I’ve come from the freeway to get to D Street and taken my life into my hand,” Lamnin said of the Hayward Loop. BY THE NUMBERS Voter Registration: Democratic 59.0%; No Party Preference 19.2%; Republicans 12.2%. 2010 Election Results: *Peixoto 29.5%; *Mark Salinas 25.6%; Sara Lamnin 20.6%; Ralph Farias, Jr. 9.7%; Steve Oiwa 7.3%; Lawrence Fitzpatrick 6.8%. PREDICTED ORDER OF FINISH 1. Fernandez 2. Peixoto 3. Lamnin 4. McKillop 5. Loche 6. Farias 7. Gallegos. 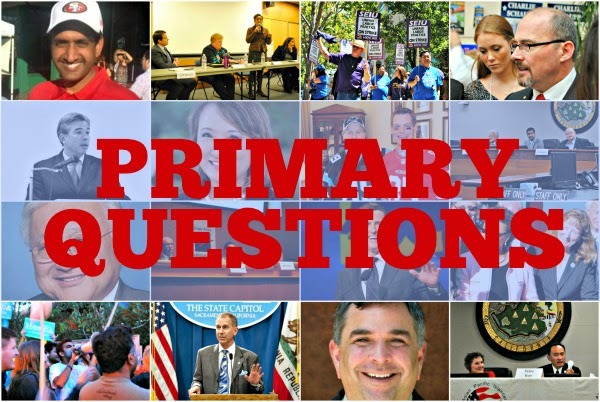 Posted in Hayward City Council, Hayward Loop, Julie McKillop, June primary, Marvin Peixoto, primary questions, Ralph Farias, Rocky Fernandez, Rodney Loche, Russell City Energy Center, Sara Lamnin, SEIU. Bookmark the permalink. Rocky Fernandez and Sara Lamnin are the only ones that will bring meaningful ideas to the Hayward city council. They are for smart growth along transportation corridors which would re-vitalize the downtown area, the city of Hayward and the small businesses. Agree—-the present City Council has screwed up royally! They are puppets for Fran David. Rocky and Sara are on the right track with their transit oriented development strategy that will bring more revenue into the city coffers. Mayor Mike never said no to union endorsements. Peixoto, Halliday, and even Anna May's favorite Councilman Greg Jones willingly accepted union endorsements, precinct walkers & phone bankers. Those idiots turned our union town upside down. Out with the old and in with the new come June 3rd. Fernandez & Lamnin for a better Hayward! Mike is history. No one cares what he thinks.